Really short entry today as I am leaving for the Catalyst OneDay Houston conference. In the last month, all 3 of our current vehicles have joined a club: someone trusted Jesus in the passenger seat! Oh, and then Sunday, after a desperate text and phone call with Jesus all in the mix, anther person trusted Jesus over the salad at Buffalo Wild Wings! ! Then there was the spare room at my friend's house house in Round Rock...that's where I was talking on the phone to Rocky when he put all his trust in the life-giving, saving from destruction and saving FOR living for what matters most Power of Jesus! Oh, and there is the newly redecorated office at Lake St. (pictured above). 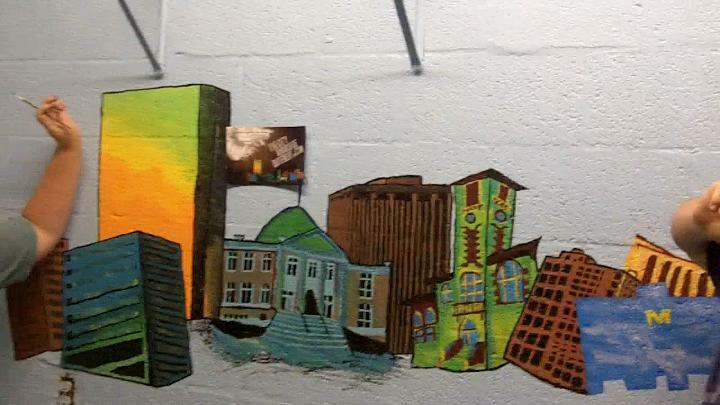 Pattie is painting a mural of theCityChurch skyline on the back wall. That's where Brittany (who trusted Jesus over salad at BWW on Sunday) heard Pattie (who trusted Jesus after midnight by the dumpster behind a bar 2+ years ago) tell of the initial steps of transformation when Jesus became Lord and Savior for her. That exchange encouraged both - and I'm so pumped! Just some examples of how God's Hope displaces the broken hopelessness on the earth which comes from our sin.